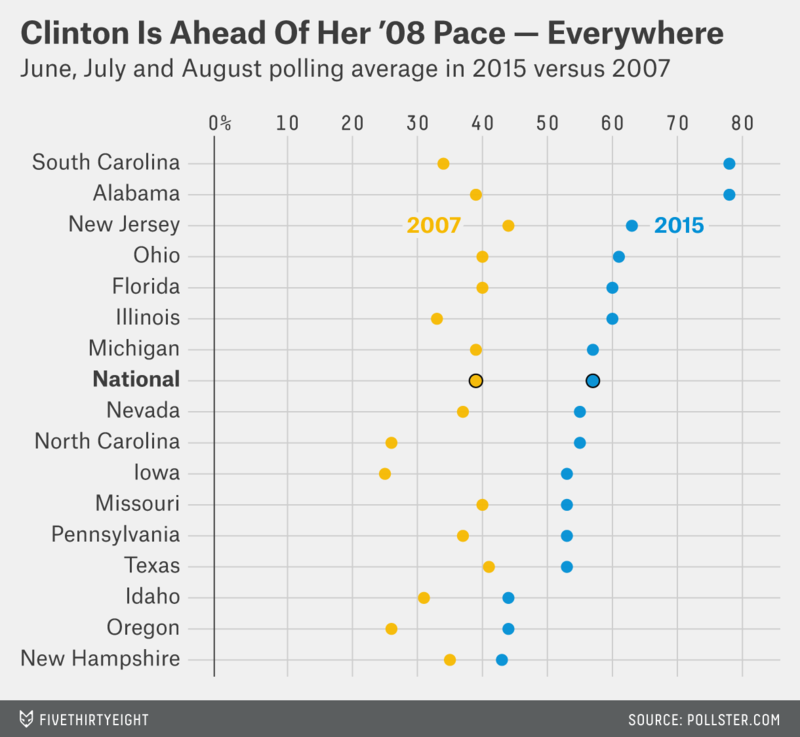 Clinton was the early favorite in 2008; she’s more than that now. Democratic presidential candidate Hillary Clinton speaks at a town hall meeting Tuesday in North Las Vegas, Nevada. Is the 2016 Democratic primary a sequel of 2008? The Bernie Sanders supporters filling up my email inbox think so. One poll is just one poll; it could be an outlier, or it could signal some shift in the race. We need more data to find out. But we have plenty of data to see a number of problems with comparing Sanders’s rise to President Obama’s toppling of Hillary Clinton in 2008. There are clear differences between the Sanders and Obama campaigns. Most obvious is that Obama won 82 percent of the black vote in the 2008 primary,1 while Sanders continues to pick up less than 10 percent of black voters’ support. But the two Clinton campaigns have big differences too. The best data we have — polling, endorsements and fundraising — says Clinton is in a much stronger position now than she was at this point in the 2008 cycle. During the summer of 2007 (June, July and August), Clinton led nationally and in many states, just as she does now. But her share of the Democratic vote in those early polls was significantly smaller than it is now. Here are the polling averages for the U.S. and the 16 states in which at least one poll was taken in both the summer of 2007 and summer of 2015. The only state where Clinton is not doing at least 10 percentage points better is New Hampshire, which is right next door to Sanders’s home state. Even there, she has captured 8 percentage points more of the vote, on average, than she did during the summer of 2007. Clinton is running 26 percentage points ahead of where she did eight years ago in Iowa. In southern states, home to many black voters, Clinton is ahead of her 2008 pace by an average of 29 percentage points. Simply put, Clinton has more support from Democratic primary voters this summer than she did in 2007. Moreover, no one in her polling position has lost a primary in the modern era. 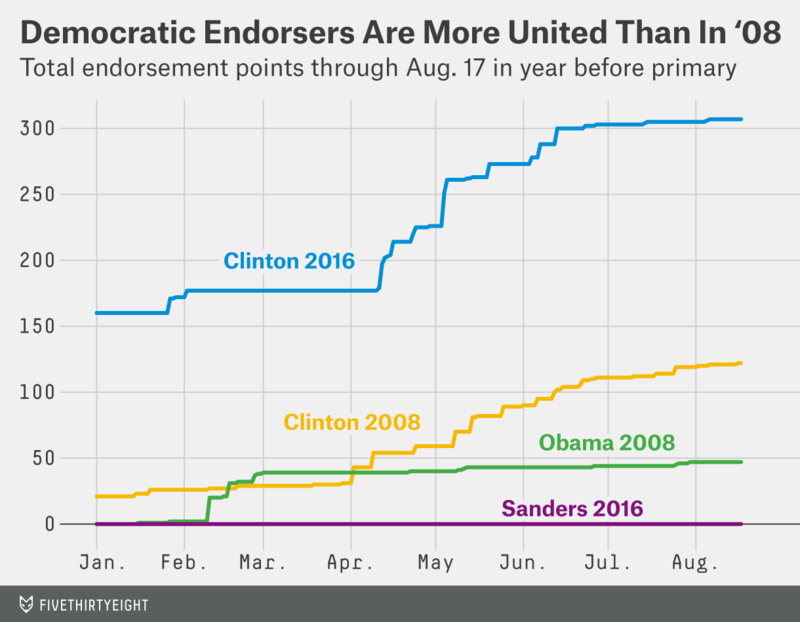 We talk about the endorsement primary a lot at FiveThirtyEight. That’s because no other variable has been as consistently predictive of who becomes the nominee. Obama was trailing Clinton in endorsements in 2007, but he still had plenty of support from governors, House members and senators. Sanders hasn’t yet received a single endorsement from anyone in those groups. Clinton, meanwhile, has 307 endorsement points2 on the FiveThirtyEight endorsement scoreboard. She has 99.7 percent of the endorsement points earned by Democratic candidates so far. She had 122 endorsement points as of Aug. 17, 2007, or 61 percent of the points then in play. In other words, Clinton has more than twice the support within the party as she did at this point in the 2008 cycle. Money isn’t nearly as predictive in election outcomes as some would have you believe. Still, Obama’s massive fundraising in 2007 was one of the earliest, clearest signs that Clinton had a fight on her hands. He pulled in 33 percent of the money raised by Democrats through June 2007. That was just behind Clinton’s 35 percent. Through June of this year, Clinton had raised 73 percent of all money donated to Democratic presidential candidates. Sanders had raised 23 percent. Clinton also has plenty of PAC and super PAC money behind her, and Sanders has chosen not to rely on super PAC support. Again, money isn’t everything. But compared with the 2008 cycle, Clinton is in a far better relative position for when the primaries turn away from the early contests to larger states in which television advertisements will be paramount. By pretty much every metric, Clinton is in a stronger position than she was at this point eight years ago. That doesn’t mean she is guaranteed to win, but the 2016 Democratic presidential primary is not the 2008 primary. Obama gained strength as the primary went on with black voters. Still, he was regularly approaching 50 percent with black voters in surveys at this point. 10 points for each governor, 5 points for each senator and 1 point for each U.S. representative.